What is your design inspiration? The beauty of handcraft is that almost anything can be reinterpreted into a special drapery panel or upholstered item for the home. 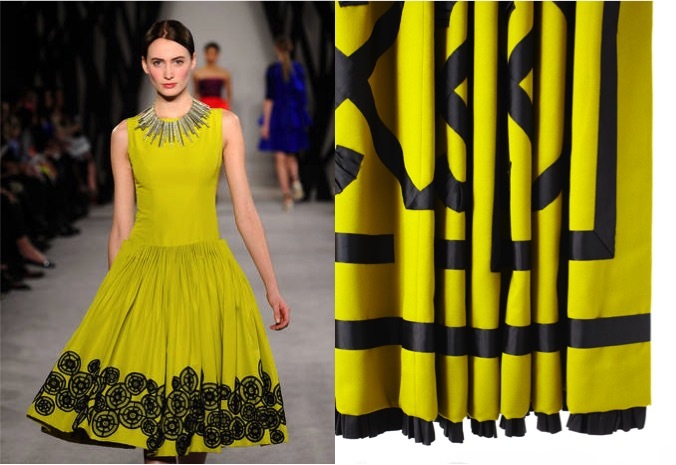 Above: a Jason Wu dress in chartreuse with black appliqué inspires a drapery panel. The gathered waist is referenced in the precise folds of the panel as well as the subtle pleated ribbon base trim. A clean expanse of charities is punctuated with ribbon in a combination of curve and geometry. Here, a glamorous spectator look from the Moschino runway finds its way onto an upholstered cornice. 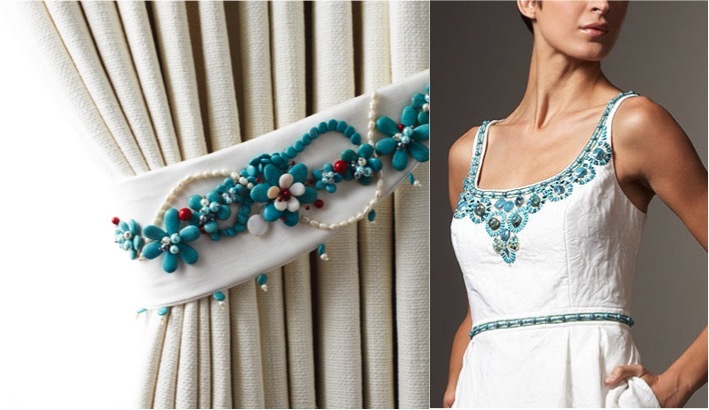 Above, from the runways of Carmen Marc Valvo and Gucci respectively, custom drapery tiebacks employ the application of semiprecious stones – turquoise and coral onto crisp, white fabric. 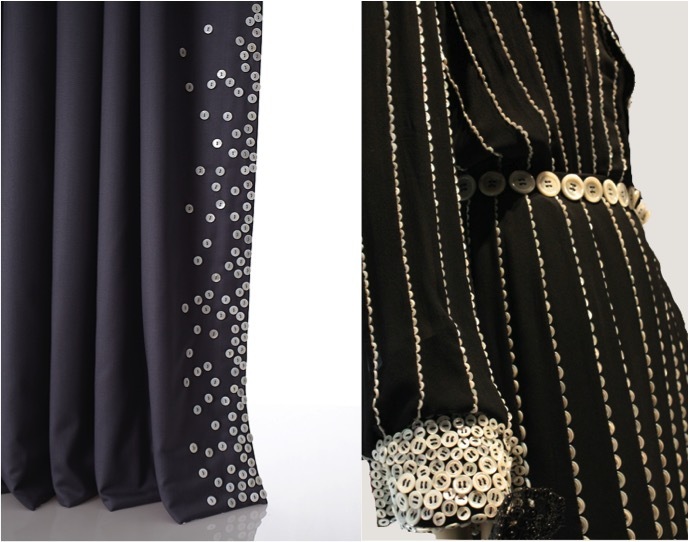 Below, a vintage Jean Paul Gaultier couture dress with thousands of bone buttons appliquéd inspired a softer version, in pearl buttons on navy for a dreamy bedroom drapery panel. It doesn’t have to be fashion that inspires, it can be a place, an era, an object or even a mood. Bring us your design vision – we’ll help you interpret it into a true couture experience for your client through upholstery, window treatments, custom bedding, custom table linens or custom outdoor cloth work. All custom window treatments in this post designed by Michael Tavano, hand crafted at Marks and Tavano Workroom, and photographed by Rick Lew. Fashions by Jason Wu, Moschino, Carmen Marc Valvo and Gucci.